The Super Mario: Yoshi Island Original Sound Version is the Compact Disc soundtrack to Super Mario World 2: Yoshi's Island composed by Koji Kondo. It was released by Nintendo on November 25, 1995 in Japan, and was published by NTT Publishing Co., Ltd. and distributed by Datum Polystar Co., Ltd.. The soundtrack is now a rare item, with some retro game stores in Tokyo offering hundreds of dollars per copy. The song "Athletic" was played on the piano by Koji Kondo at a Video Games Live concert as part of a medley. The song "Athletic" was played again by Koji Kondo on a electronic keyboard at Nintendo World 2011 as part of another medley. The song "The Flower Garden" was reorchestrated for the Japanese Super Mario World 2: Yoshi's Island commercial. The song "Map" was reorchestrated for the Japanese Yoshi's Island: Super Mario Advance 3 commercial. The song "Athletic" was played by the Kanagawa Philharmonic Orchestra in 1996 on the Game Music Concert 5 album of the Orchestral Game Music Concerts. The song "Athletic" was also recorded on the Mario & Zelda Big Band Live album in 2003. The songs "Yoshi's Start Demo", "Powerful Baby", "The Flower Garden", and "Castle & Fortress" were played by the Video Game Orchestra at Penny Arcade Expo East 2010 and Boston Anime 2010 as part of a medley of music from the Yoshi franchise. The song "Athletic" is included in Nintendo's official sheet music books. All the songs were reused in the Game Boy Advance remake of Super Mario World 2: Yoshi's Island, Yoshi's Island: Super Mario Advance 3, but in decreased audio quality. Other than that, the songs also returned in later games, and most of them are remixed or re-arranged. The songs "Athletic", "Mid-Boss", and "Underground" are used in the Super Mario World 2: Yoshi's Island: A Magical Tour of Yoshi's Island promotional VHS. 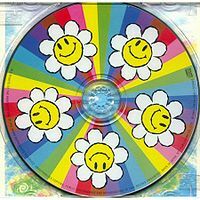 A portion of the song "The Flower Garden" is briefly recalled in Yoshi's Story, as part of the song "Games of Happiness". The song "Powerful Baby" plays in Super Mario 64 and Super Mario 64 DS when a Wing Cap is equipped, in some Super Mario 64 DS mini-games, in New Super Mario Bros. when a Super Star is equipped and in some mini-games, in New Super Mario Bros. Wii, and in Super Mario Galaxy and Super Mario Galaxy 2 when a Rainbow Star is equipped. It is also played in Mario & Luigi: Superstar Saga, in the Star 'Stache Smash minigame. The song "Yoshi's Island" plays in Paper Mario on Lavalava Island. The song "Yoshi's Island" plays in Mario & Luigi: Partners in Time on Yoshi's Island. The songs "Athletic" and "Yoshi's Island" are used in Itadaki Street DS. 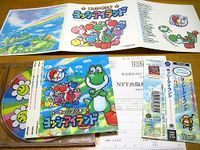 The songs "Athletic", "The Flower Garden", "Story Organ", and "Powerful Infant" are used in Yoshi Touch & Go. The songs "Story Organ" and "Yoshi's Island" are used in Tetris Attack. The songs "Athletic" and "The Flower Garden" are used in Super Smash Bros. Brawl. The song "Athletic" is used in Daigasso! Band Brothers. The songs "The Flower Garden", "Story Organ" and "Map" are used in the "Yoshi's Island" song in Super Smash Bros. for Wii U. The songs "The Flower Garden" and "Goal & Score" were remixed into Yoshi's Island Zone from Sonic Lost World. The Super Mario: Yoshi Island Original Sound Version CD, adorned by Flowers. This page was last edited on March 15, 2018, at 21:16.